(1) Visit our new Lippincott Williams & Wilkins books page, listing 60+ of their books. We are in the process of converting all of our Books pages to this cleaner format. All newly posted books are also posted on our New Books and Books by Author pages, and on the Specialty pages. (2) Don't forget to make your online purchases at Amazon.com by first clicking on one of our Home Page Amazon.com banners, or a link on the Books pages, or by clicking here. (3) Recent updates include: Breast malignant, males, children chapter, based on reviews by Dina Kandil, M.D and Monika Roychowdhury, M.D. ; Soft Tissue-Adipose chapter, based on reviews by Vijay Shankar, M.D. ; Urethra chapter based on reviews by Turki Al-Hussain, M.D. (4) We posted two new articles on our Management Page: Missing Accession Audit Process, by Diana Brooks, PSA, LLC, and Changes in the Anatomic Pathology Billing World, by Mick Raich, President, Vachette Pathology. A 45 year old woman had an MRI for headache, which showed a dural-based extra-axial lesion of the left parietal region, with dural enhancement, and surrounding grade II vasogenic edema. At surgery, the lesion was red and richly vascular. Gross total excision was performed. 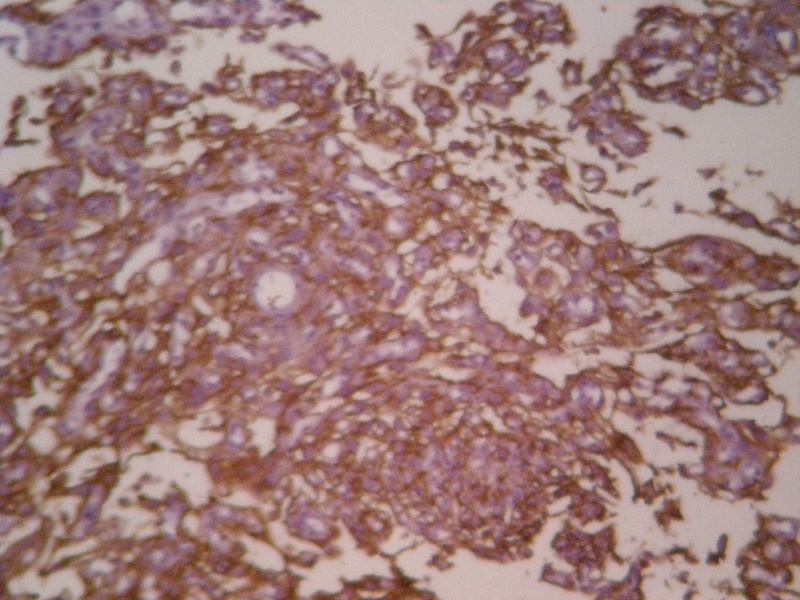 Macroscopic examination: Multiple brownish soft tissue fragments (2.5 x 1 x 0.5 cm in aggregate) with a spongy appearance. The microscopic images reveal a loosely textured pattern created by intra- and intercellular microcystic spaces. 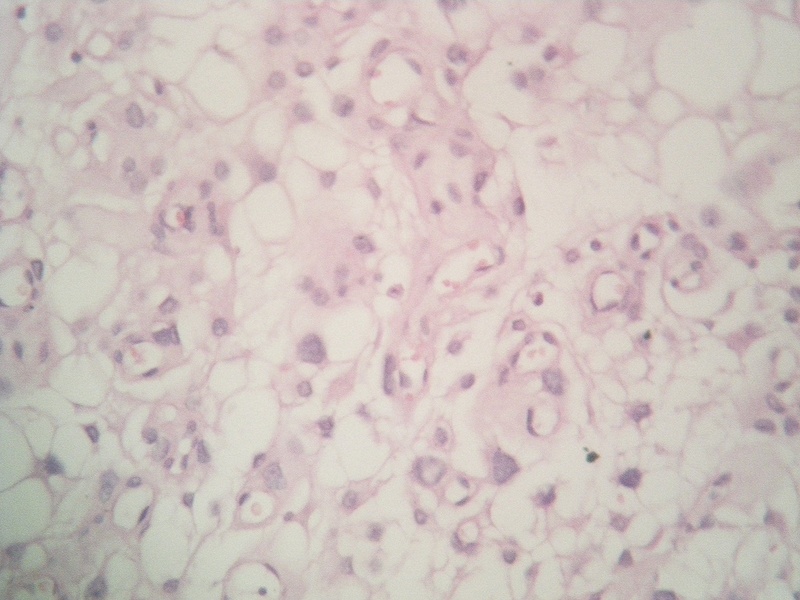 Scattered cells with pleomorphic hyperchromatic nuclei are seen, as well as thickened blood vessels with hyalinized walls. Focal xanthomatous change is present. 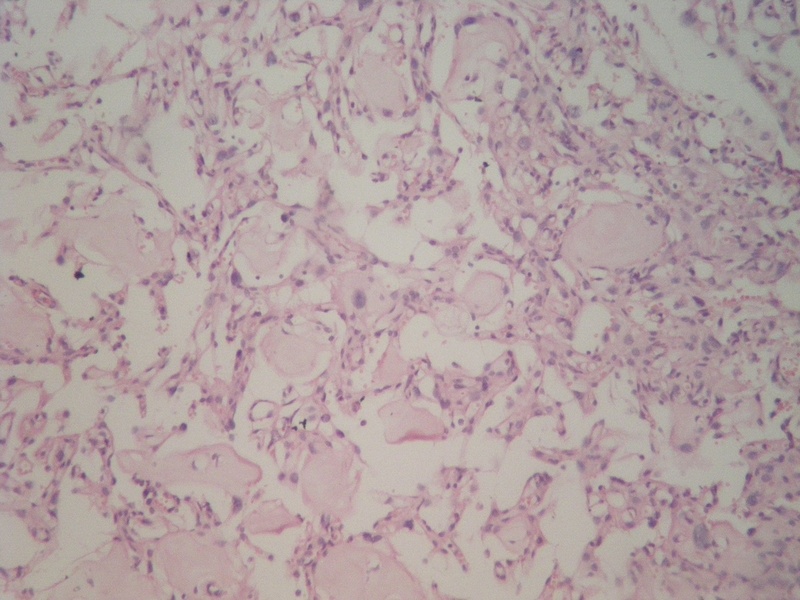 Microcystic meningioma is a variant of meningioma characterized by cells with thin, elongate processes encompassing microcysts. 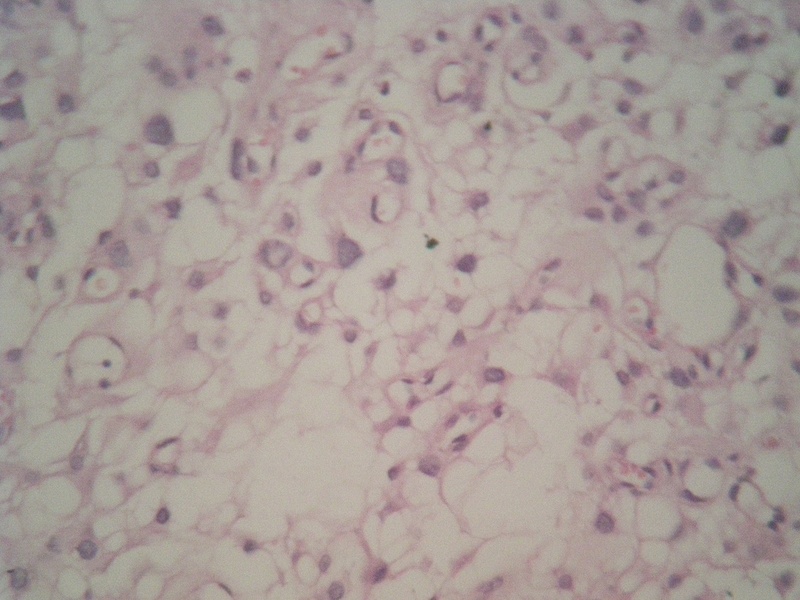 Pleomorphic cells, xanthomatous change and thick-walled blood vessels are common. Accompanying cerebral edema and macrocysts may be seen. It has benign behavior and corresponds to WHO grade I, with no prognostic significance assigned. 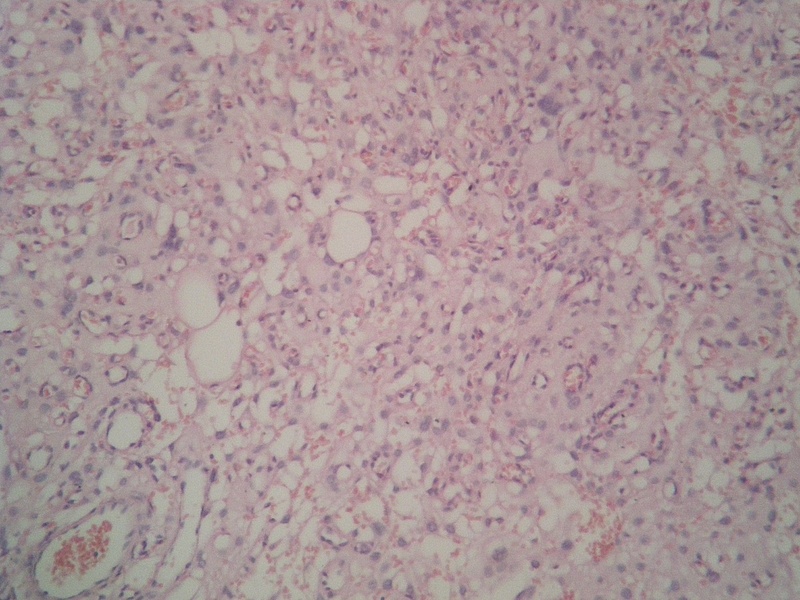 Microcystic meningioma (especially in a pure form) frequently creates diagnostic problems because of the minimal morphological clues of its meningothelial nature. Recognition requires awareness of its existence. Meningioma should always be considered for supratentorial extra-axial enhancing lesions. 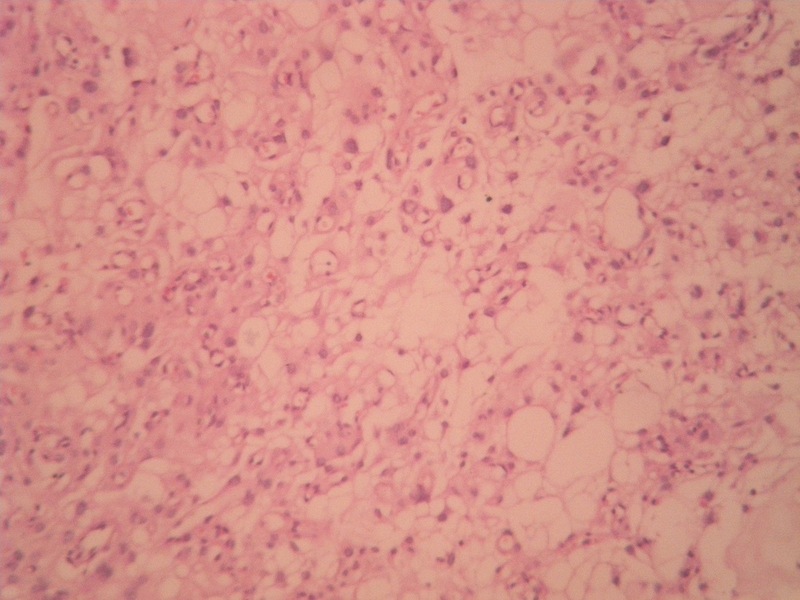 Histological clues to diagnosis include a loosely textured pattern with microcysts, nuclear pleomorphism and thick-walled hyalinized blood vessels. 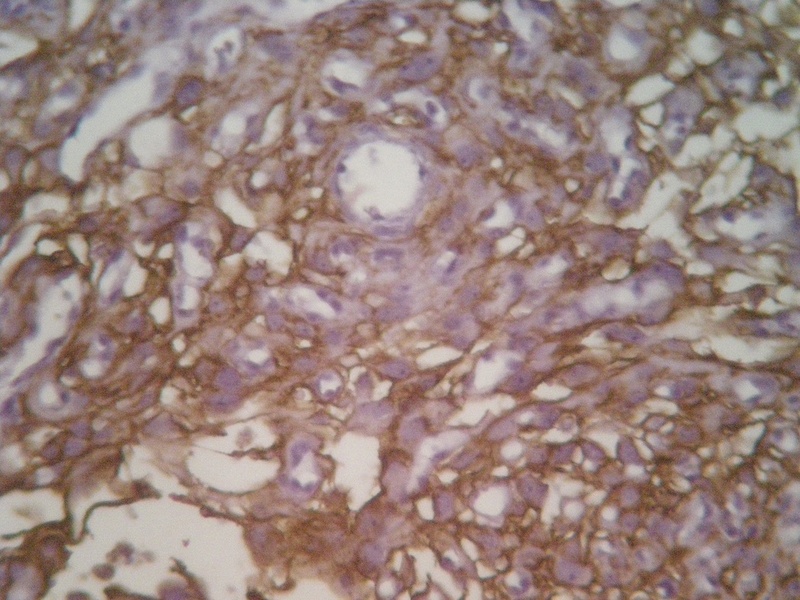 EMA staining is confirmatory. In the case under discussion, the supratentorial extra-axial location, contrast enhancement, characteristic histopathological features and immunoreactivity for EMA were all in favor of microcystic meningioma. 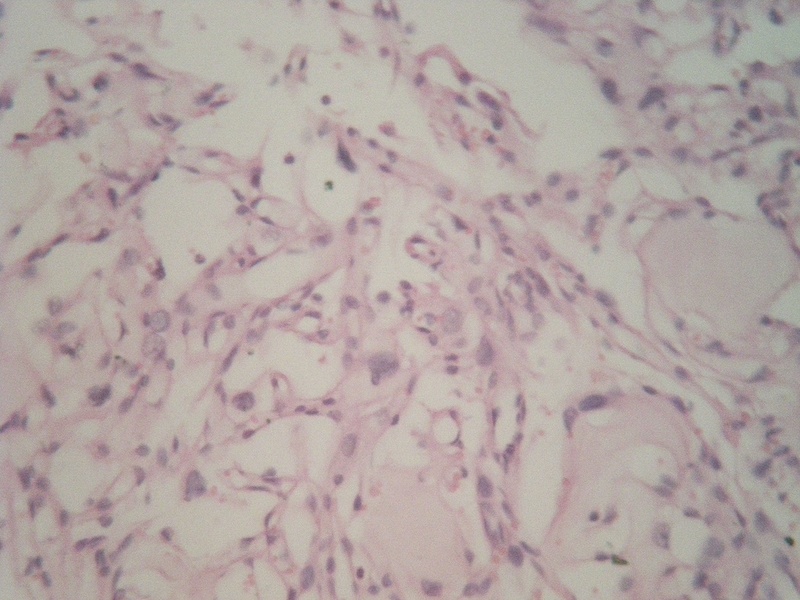 The tumor did not show atypical features and it was assigned to grade I. 1) Louis DN, Ohgaki H, Wiestler OD, Cavenee WK, eds. WHO classification of tumors of the central nervous system. 4th edition. Lyon: IARC Press, 2007. 2) Paek SH, Kim SH, Chang KH, Park CK, Kim JE, Kim DG, Park SH, Jung HW (2005). Microcystic meningiomas: radiological characteristics of 16 cases. Acta Neurochir (Wien) 2005;147:965.